It might be surprising to learn that the biggest academic employer on campus is the UO Libraries system. Even more surprising is the variety of work students do. Yes, they reshelve books. But they also process the new ones and repair precious old ones. Student employees administer user experience surveys, help patrons navigate databases, and troubleshoot problems with the information technology infrastructure. Tutors help hundreds of their fellow students with math homework and test preparation. At the Center for Media and Educational Technologies, student workers retrained the entire UO teaching faculty last year, bringing them up to speed on a new learning management platform. And a student archivist unearthed footage of the first sub-4-minute mile ever run on U.S. soil. Lauren Goss, a master’s student in library and information science, uncovered that gem working as a Thomas Intern with the UO Libraries. 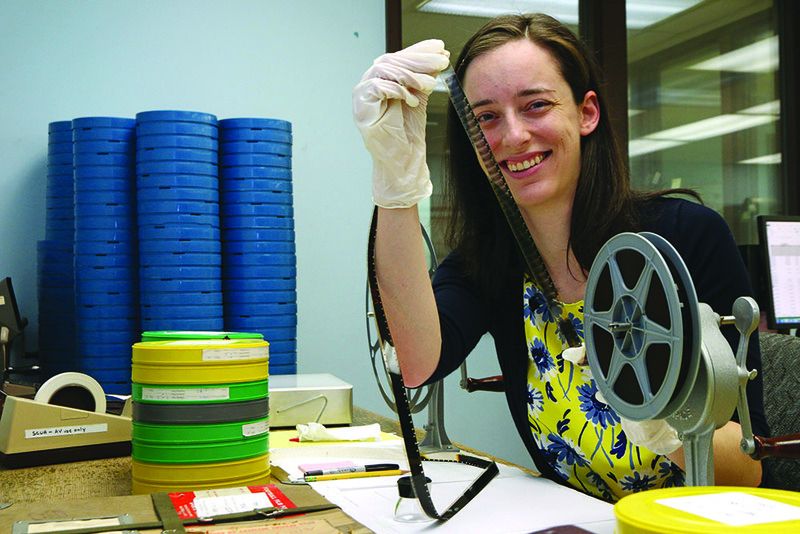 One of her tasks is preserving and classifying the Athletics Film Collection, which includes almost 4,000 items spanning the 1930s to the 2000s. Working to identify unmarked reels, Goss discovered long-lost footage of 1958 UO graduate Jim Bailey’s historic run at the Los Angeles Memorial Coliseum in 1956. The significance of the clip didn’t escape Goss, a third-generation Duck who earned her bachelor’s degree at the UO. Among her latest discoveries is color footage of the 1939 victory parade and celebratory dance following the Tall Firs’ national championship in men’s basketball. For many students, a part-time job is not just about pocket money. It’s the only way they can pay the rent and buy food and books. However, the benefits of a good campus job are more than financial, said Patrick Moore, the library’s human resources manager. Tom Wolken, a 2016 graduate who worked in the science and math libraries, said he landed his library job thanks to a lucky email tip his first year on campus. A physics major from day one, he was thrilled to find a job opportunity that directly involved science and math. This fall, Wolken will begin graduate studies in the medical physics program at Oregon Health and Science University. Looking back, how would he assess his time as a student employee with the UO Libraries? One thing that all these jobs have in common: The UO depends on the generosity of donors to keep offering so many of them. Though a number of the library’s student workers have federal work-study support, many others do not. To offer the broadest opportunities, attract the best pool of applicants and provide work for the maximum number of students, the library must raise additional funds through donor gifts. It all adds up to a big win for everyone involved: the student employees and their families, the UO Libraries and the university community.